Towards Sustainable Productivity – III Integral Motivation | Fourth Dimension Inc.
For sustained performance Job satisfaction has to be combined with the impetus for growth. A system of motivation, which leads to integral performance, has to take into consideration two important factors: Resonance and Growth. Resonance means a perfect matching or synchronization between three aspects of what is called as “Job-satisfaction”. First is the motives, attitudes, values, temperament and talent of the individual; second is the nature of the job; and the third is the reward system. In other words, the nature of job has to be in harmony with the inner psychological makeup and capabilities of the individual and the rewards should be tailored not only to the performance of the individual but also to his aspirations and expectations. This resonance gives what is called as “Job-satisfaction”. However mere job-satisfaction is not enough. 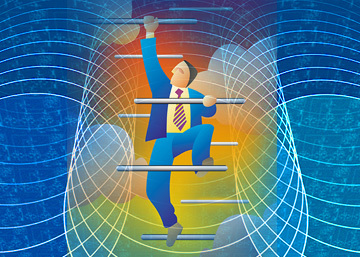 For achieving integral performance, there must also be constant growth. For, evolution and growth are one of the eternal laws of life. So anything which remains satisfied with the status quo begins to die and disintegrate. So there must be growth not only in terms of professional knowledge and skill but also towards higher levels of motives, values and potentialities spanning the whole being of the individual from the physical, vital and the mental to the spiritual levels. Each stage of this growth, from physical to vital, vital to mental and mental to spiritual, uplifts the individual to higher levels of potentialities and as a result releases correspondingly higher levels of creative energy into work. A human organism begins her evolution as a physical person, trapped in her bodily consciousness, preoccupied with her material and survival needs. As she progress further, she becomes the vital person centred in her emotional and dynamic and pragmatic faculties of action and desire, seeking for harmonious relation, pragmatic adaptation, achievement, expansion and mastery over the environment. The vital person is at a higher level of potentialities than the physical person because she is capable of a higher range of emotions, energy, knowledge and action and therefore brings a greater efficiency, productivity, vigour and dynamism to the physical and vital life of the community. As the human soul progress further on in its evolution it becomes the mental person who lives poised in her thinking, ethical and aesthetic intelligence, seeking for knowledge and for a better understanding of the higher laws, aims and values of life and trying to organize her life around these higher verities. The mental person is at a higher level of potentialities than the vital person because she brings a higher knowledge, culture, refinement and values of the mental being to the physical and vital life. As the mental person ascends to the highest summits of her development, she opens her consciousness to the spiritual dimensions of his consciousness. Here begins the spiritual evolution of the human soul, which will lead to the highest fulfillment of the human being. One of the major aims of evolutionary motivation is to consciously accelerate this progressive natural evolution of the human being from the physical, vital, mental and to the spiritual consciousness and manifest this growth in every activity of the corporate life. In fact whatever may be evolutionary status of the individual; this four-fold development can be pursued simultaneously but with an emphasis on developing the unmanifest potentialities of the next stage of evolution. For example, the physical person has to be goaded or induced to develop the potentialities of her vital being and pragmatic mind which will bring greater energy, dynamism and the capacity for a successful dealing with the pragmatic realities of life. But at the same time, she must be awakened to the need for knowledge and ethical discipline. And finally even the physical person can progress spiritually by pursuing an inner and outer discipline of religious and spiritual dedication of her outer activities.